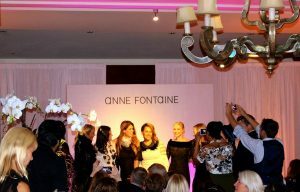 Anne Fontaine describes her Fall-Winter 2016 Collection as “decadently detailed,” and her exclusive showing at Boston Fashion Week was nothing short. 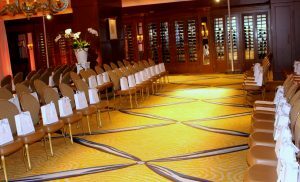 The intimate event was held in an elegant ballroom at the Four Seasons Hotel on Thursday, September 29. A clean layout and white decor were the perfect accents for creating a sophisticated environment worthy of showcasing Fontaine’s regal designs. Guests were immersed in the Parisian culture upon entering as a French vocabulary lesson played over the speakers. 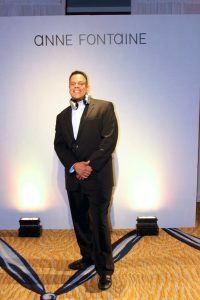 The entertainment was provided by DJ Mike Amado of Entertainment Specialists, who added a modern twist by setting the show to electro pop songs. The contrast between the music, venue and designs created an effortlessly chic vibe. The most delightful part of the show is that part of the proceeds benefit the Crohn’s and Colitis Foundation of America, New England Chapter. 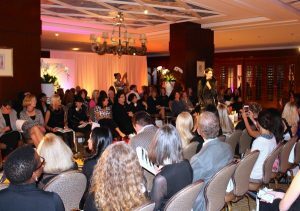 Boston Fashion Week definitely saved the best for last!